As a child of the eighties, I fondly remember spending hours setting up, tweaking and dismantling Scalextric tracks, particularly at Christmas. What tended to happen, however, is that some piece of it would break, or the track wouldn’t quite lock together properly, or the brushes on the cars needed constant adjustment. Whatever the reason, and however fun it was, the actual driving time never felt that long. That’s not a problem that befalls Anki’s second generation of robotic racing (and battling) cars; they totally blew me away. 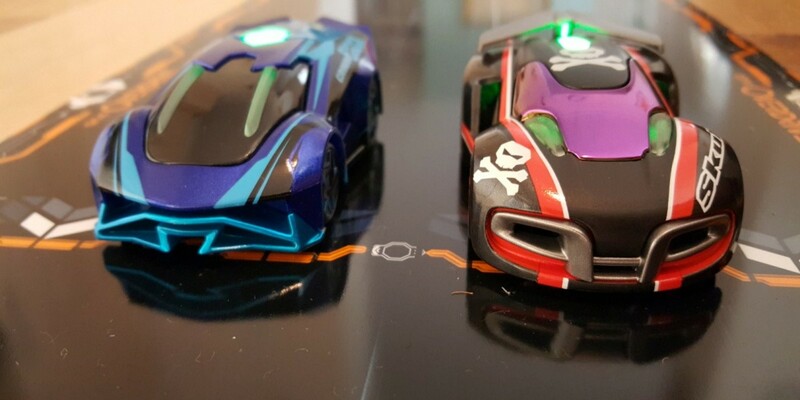 A safe bet to get up and running is the Anki Overdrive Starter Kit, which costs $150/£150. For that, you get 10 sections of track, two cars and a charging pad that can replenish up to four vehicles at once. Don’t think you’re going to need to leave them to sit around charging all day though – 10-15 minutes and you’re back at maximum capacity. Setting up the track is also a quick and simple process. You also get two riser sections to create a raised track, if you want. The Starter Kit can be arranged in eight different layouts, and additional track, car, riser and other accessory kits are available as an additional purchase. Once you’re track is set up, you can start racing! The cars will happily drive themselves, but controlling them via a smartphone lets you change lanes, adjust the speed and fire your various weapons at your opponents. There are a few different game modes to play around with too, ensuring that the Anki set shouldn’t be relegated to the cupboard under the stairs as soon as Christmas is over. It’s an almost perfect merging of offline play with the digital world and an immersive gaming experience. Although it’s not the cheapest gift you’ll see in this recommended gift series (and particularly if you buy additional extras – I’d recommend at least one more car and a few track sections) it is one that should provide good clean fun for everyone. Old or young, if you’ve ever played Mario Kart or Scalextric, you’re going to love this.